In this digital age, we all would love to have digital money than conventional notes and coins. People are now using online wallets instead of hard cash due to the convenience. But there can be one problem of choosing the best online wallet. Along with the facility of online wallet, you may need some other features like shopping or recharging your mobile phone. So Mobikwik offers the ultimate solution to all your problems. It will let you to transfer funds, recharge accounts, and pay for online shopping. As the name suggests, its the kwikest (quickest) way to do online transactions. Let’s take a closer look at what this online wallet can do. Mobikwik has a website where you can sign up to create a new account and get your own wallet. They also have mobile app on all the major platforms like Android, iOS, and Windows. Lets start with the website of Mobikwik. Using the website you can recharge mobile or other devices like television and data cards. You can your bills using the wallet. Just transfer funds to your wallet once and then do multiple transactions. One more benefit is that you get exciting discount and cashback offers when you pay using Mobikwik. Paying the bills, recharging, shopping and getting discount offers too, well using online wallet is fun and profitable. With the security point of view its much safer to pay using mobile wallets rather than entering sensitive credit/debit card information every time. Even if your account gets hacked, you will still not lose all the money you have. Here are all the partners that supports payment using Mobikwik online wallet. You can use the real features of online wallet with the mobile app only, i.e. on the go. You can transfer funds to others Mobikwik wallet and also request funds from your friends by avoiding the awkward situation. Just remember to set a PIN before you put some funds in your wallet. Also you can use promo codes to get more benefits from Mobikwik. 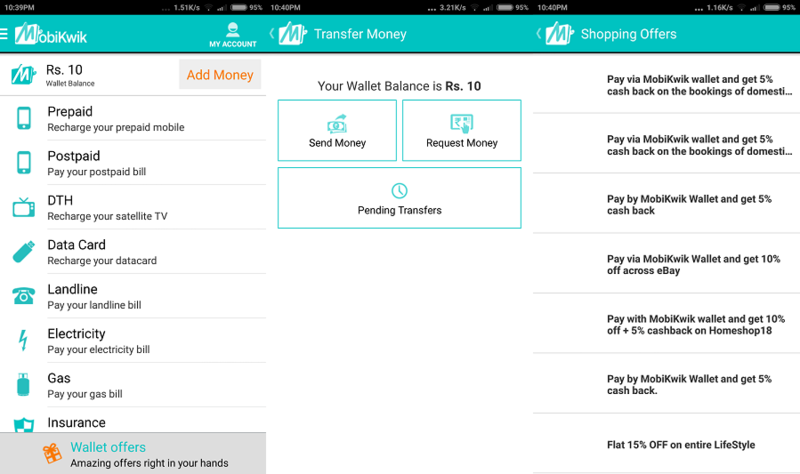 Here are some screenshots of the Mobikwik Android app. You can also recharge and pay bills using mobile app the same way you do using the Website. Give Mobikwik a try and let us know your views in the comment section below.